Since ubuntu 10.04 Skype is part of the Canonical partner repository . Hence you can to install Skype easily. To install Skype in Ubuntu 10.04 Lucid Lynx from the partner repository, go to System > Administration > Software Sources and on the "Other software" tab, enable (check the box next to it) the "http://archive.canonical.com/ubuntu lucid partner" repository. A simple way to encrypt a file with a password is to use gpg (GnuPG). Suppose we have a file mysamplefile.txt, to encrypt it type the following on console. A new file named mysamplefile.txt.gpg will be created. Again it will ask the paraphrase and decrypt the file. The window control button layout on new ubuntu 10.04 is very confusing to me. I just wanted to shift them to the right as shown below. The easiest way is to download and install ubuntu tweaks from here. 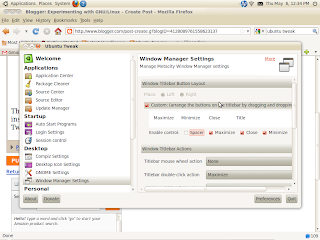 When installed ubuntu tweaks shows up under Applications ->System tools -> Ubuntu Tweaks. 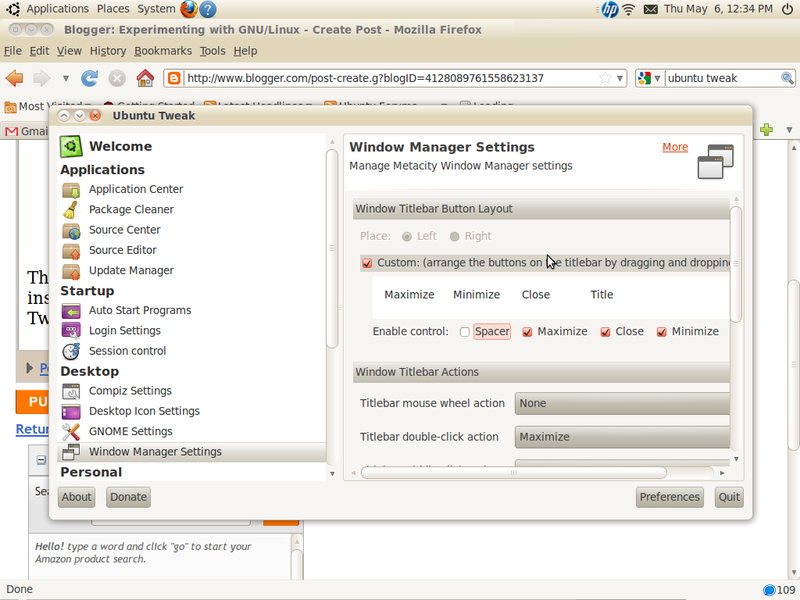 Launch it and select window manager setting on the left panel. 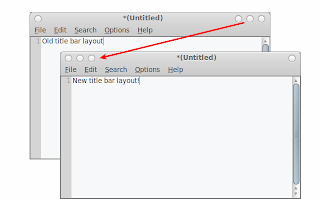 You can rearrange the control button and title bar by dragging them to appropriate positions as shown below. Install unp and forget about all worries about archives. tar.gz2, rpm or any other archive. Then virtual box started showing the following error message. The following commands fixed it.